Browse > Home / Where Do You Go on Vacation When You Live in Paradise? I’ve just taken a break from publishing regularly and I admit this will likely continue on and off. BUT, I still love each and everyone of you and look forward to your visit here, to receiving your questions about Lake Chapala – Ajijic and when you visit meeting you in person and showing off the area. I’m still working as a “Buyer’s Only Realtor” and do not accept listings as I want to be in a position not to have a conflict of interest. If I had a bunch of listings I’d likely have a bias toward my listings. I do not believe in playing both ends against the middle so to speak. Even after 16 years here at Lake Chapala I can truthfully say, I can’t think of anyplace else I’d rather live, all things considered. We do not need AC or Central heat here as our winters and summers are mild. We pretty much have year around spring like weather. To see past and current weather here just click on the weather link on our home page. That link takes you to a local weather station right here on the North Shore of Lake Chapala. I recently returned from a very pleasant stay at a resort hotel in Cancun, a short local trip by air from our International Airport (Symbol GDL) . Great Beaches, Great Food and Great Accommodations! Pleasant weather, a bit warmer and humid than Lake Chapala, so the AC felt good when not hanging out at the beach taking in the sun and surf. 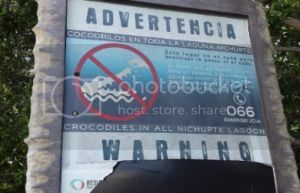 We noticed as we walked along one of the main roads in the “hotel zone”, there were water ways a few yards across leading to the ocean, and each had a sign warning of Crocodiles . Well, thanks for listening. I just wanted you guys to know you can easily get from North America to all the major Mexican beach areas by road or air from here, but our area is blessed with not being too hot, too humid or too cold all year long and being a native Dallasite, I’m happy Dallas ( DFW International) is just a few hours away by air as well. Oh Yes, No Crocodiles ! Love the Beach, Love the Moutains, Love Lake Chapala? Have it All! Why Mexico? Why Lake Chapala? Why Not ! Now that I live here, I have a hard time thinking about where I want to go on vacation. I ask my husband, ‘Why leave, it’s so nice here?’ We are going to Morelia to see the butterflies in March. There is so much to see in Mexico! !